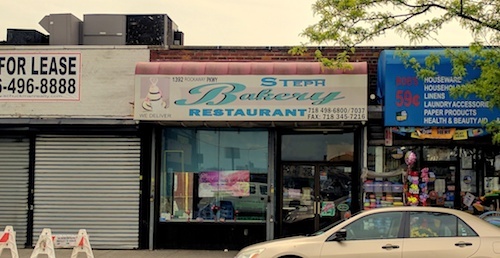 With such a nondescript awning and front window, this small Canarsie shop might be passed by without a second thought. As I was taking a circuitous walk from Brownsville to Sunset Park one weekday afternoon, I thankfully had the memory of a small mention by Eating in Translation from a couple years ago to bring me inside. Unfortunately that mouth-watering cheese straw pictured was unavailable this day, but the bakery and restaurant do offer a lot to choose from. Upon walking in, no one immediately comes to the front, which is beneficial to peruse everything they have on offer. Three cases hold a vast array of sweet rolls typical of Caribbean sweet rolls, full cakes, slices of cakes, bags of sweet buns and loaves of bread. The women that work here stay busy in the back until exactly the moment a customer is ready, as if they are secretly reading facial expressions. The neon paper signs on the wall list hot Caribbean dishes like oxtail and goat curry, stew chicken and fish. While these dishes may not all be specifically Grenadian as the small flag and home country of the owner and employees are, they must be popular in a very Caribbean neighborhood and necessary for business. 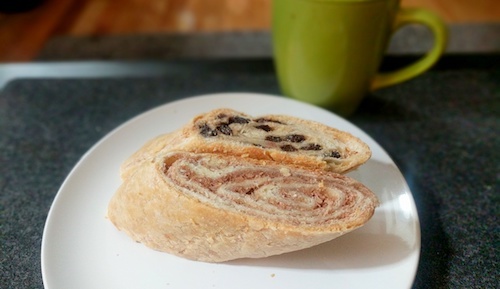 One currant roll ($2, below) and coconut roll ($2, below) was asked for to go, and eaten the following morning with coffee. They retained their moistness perfectly, and were enjoyed as usual. The most tempting display in the shop is probably the case of patties, ten different varieties kept warm for immediate eating. 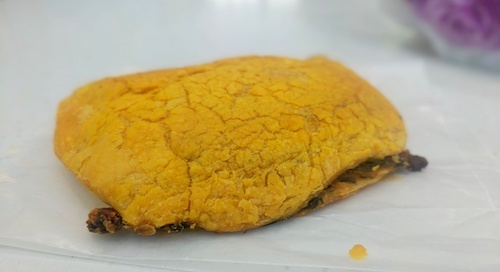 The callaloo patty ($2.40, below) was the most enticing on this day, a rectangle of yellow dough with hints of the stew oozing out. The leafy vegetables seem creamy with coconut milk, onion, and garlic. Callaloo played such a big part in the oil down which was the introduction to Grenadian food on this website, so it seemed the right choice for a patty here. After eating, the little shop's character started showing through. Copies of Caribbean Life Magazine were available for free, artwork showing island life alluded to fresh air and warm ocean waters. Rhum Runners set off from docks in the capital of St. George against the backdrop of colorful homes and churches. After a while, another woman comes in and asks for oxtail. When she finds out it is not available, she turns around and says "Well, I will try again next week!"